The Animals of Farthing Wood is an animated series by the European Broadcasting Union between 1992 and 1995, based on the series of books written by Colin Dann. It was produced by Telemagination, based in London, and La Fabrique, based in Montpellier in France, but also aired in other European countries. The first countries to air the series were Germany and the United Kingdom, in January 1993. "A group of animals have to leave their home, the Farthing Wood which was destroyed by the people. They travel to the famous White Deer Park and want to make a new home there. Fox is their leader and Toad their guide. Also with them are Badger, a very old resident of the Farthing Wood, Owl, which is very wise and often helps them, and Mole, the little friend of Badger." This is all 3 seasons of the television series (39 Episodes) The TV shows follow the basic plots of the series of books, although certain elements were changed. It followed the animals of Farthing Wood, who were forced to flee their homes after humans started destroying the wood in order to build houses. Led by Fox, and guided by Toad, the animals left Farthing Wood on a journey to White Deer Park, a nature reserve where they would be protected. 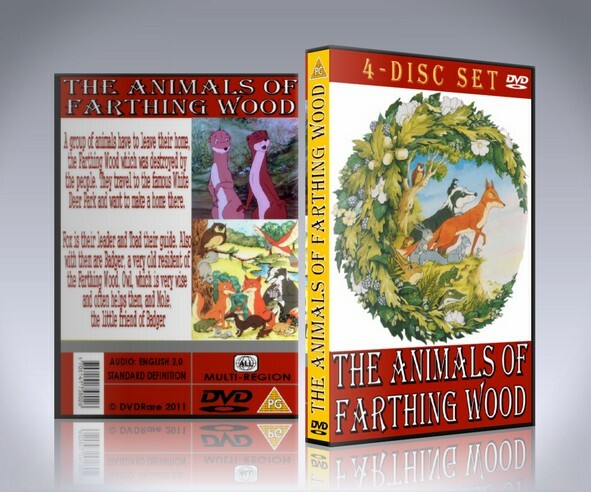 Unlike other children's series and films, The Animals of Farthing Wood did not feature much comedic content but rather relied on its strong storyline and plot, and multiple main characters are killed or die during the journey. Series 1 chronicled the journey to White Deer Park, Series 2 took place in White Deer Park and chronicled the feud between the Farthing Wood animals and the hostile blue foxes, the third, and final, series chronicled the invasion of the rats into White Deer Park and the animals' attempts to fight them off. The episodes were made in both the UK and France. Because of this, in Series 1 the motorway's carriageways have traffic driving on the right hand carriageway of the motorway. However, they are briefly seen in Series 3 driving on the left hand side. The Animals begin their journey from Farthing Wood to the safety of White Deer Park. Season 1, Episode 6: Who Shall Wear the Crown? The DVD is Brand New and Sealed!